Another useful addition in our Roomfold Deluxe oak bifold door systems. 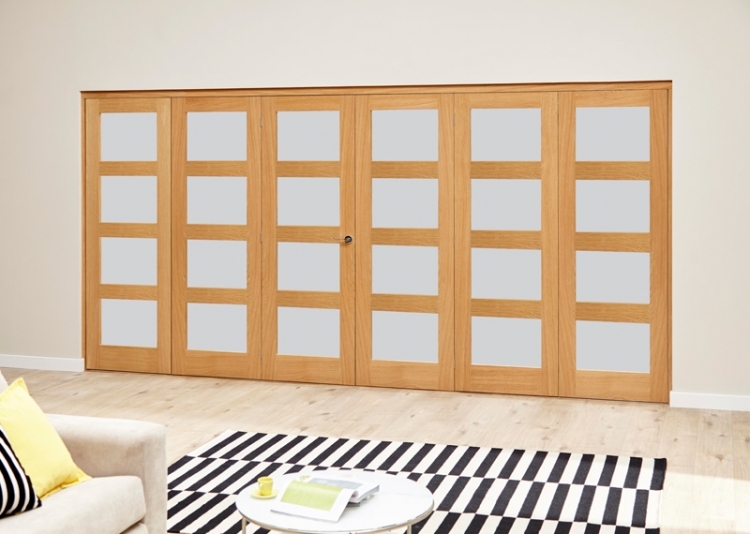 This frosted glass prefinished oak door leaf system provides a great alternative to our standard internal bifold doors. Very competetively priced and fantastic value for money, but no reduction in quality!! These roomfold systems are available in 3, 4, 5, and 6 door systems, using 533mm, 610mm 686mm and 762mm wide oak internal doors you ensure that installation is made simple with no planing of doors on site and a simple installation routine to follow to assemble the doors and frame in the opening. Joiner recommended. To decide on the best solution of which bifold doors are for you, take time to review the opening sizes and product sizes available before selecting the option to buy. Please refer to our storage and decorating recomendations before installing the doors. All doors MUST be decorated before installation.